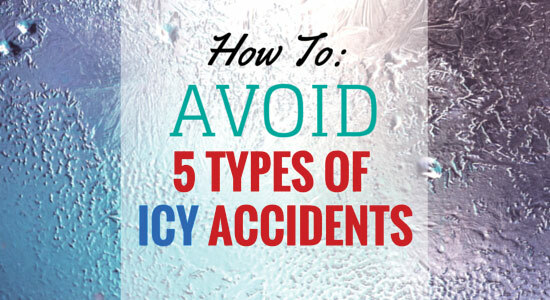 Icy conditions can be even more dangerous than slushy or snowy ones. As winter temperatures fluctuate, densely packed snow on the ground melts and then refreezes into patches of ice. These slippery spots can lurk on roads or sidewalks even when it's sunny, but temperatures are not yet high enough for it to melt. While most people know to be cautious when it's actively snowing outside, they may not act as carefully when the sun is shining—and this can lead to many types of accidents. We've compiled a list of five of winter's worst types of icy accidents and some tips to help prevent them. Isolated ice patches are a hazardous winter road condition that can contribute to car accidents. We see a tremendous increase in the number of car accidents and motorcycle accidents once the cold weather hits and there's a couple reasons for that. Snow and ice on the road make the roads slick and make people have accidents that's pretty self-explanatory. However, once the weather gets below freezing, what you have is the water which normally drains and runs across the road or the pools, freezes. And now when you're driving, even if it's not snowing, you may have a big slick ice patch right in the middle of the road. What also happens with these, and they're called isolated ice patches, as soon as the weather gets back up toward the thaw point and it goes above freezing. The ice patch turns to slush or water, cars drive through it, and then the it's called tracking. The cars track and splash the puddle to the point where what is a three foot wide puddle is now 12 feet wide and across the lane. And even worse cars ride through and the tires track it down the road and you suddenly have a 100 foot long by 12 or 15 foot wide ice patch once the weather goes below freezing again. Very very dangerous! You may not always be able to maneuver around an ice patch on the road, but you can give your car the right "armor" to defend against them. Outfitting your vehicle with snow tires during the winter months is one of the best ways to prevent a car accident. Tires specially engineered for winter offer a huge advantage to drivers, especially in areas where the temperature drops below freezing. Still not convinced? Take a look at the 7 Reasons Why You Need Snow Tires Now. Four-wheel drive and all-wheel drive also offer drivers an advantage in inclement weather. However, these features don't act as a "Get out of Ice Free Card." Drivers shouldn't overestimate their ability to drive safely on ice, and should still drive with extra caution. Businesses both small and large receive significantly more foot traffic than the average home. If the business fails to properly clear their parking lot or walkways of ice, things can get dicey for customers. When you're crossing parking lots and sidewalks on your way into the store, be mindful of snow or ice that might cause you to fall. Keep an eye out for shiny surfaces, unsalted areas, or even well-worn pathways where snow has become hard and smooth. However, business owners have a responsibility to keep their parking lots and walkways clear of snow and ice hazards. If you were to get injured on a business' property, they could be liable for any costs associated with that injury. Whether you come across an ice-coated sidewalk on your morning commute or your own property, beware! 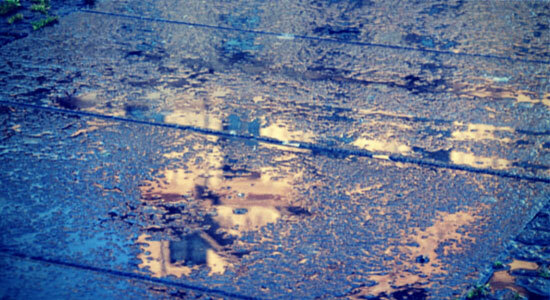 Icy walkways can lead to serious slip and fall accidents. Sometimes, they can even be hidden by a light dusting of snow, making them hard to see. Wear snow boots that provide lots of traction if you do a lot of walking during the winter months. Owning a home means you are responsible for snow and ice removal. This includes walkways, driveways, and sidewalks among other areas. If someone is injured on your property, you could be held legally responsible. The best way to avoid injuries from icy walkways is by removing ice in a timely fashion. Our guide, Clearing Snow and Ice: Who's Responsible, can help. Icicles are another hidden danger this time of year because they aren't always in our field of vision. But, just like ice on the ground, property owners have an obligation to keep guests from being injured by these hanging hazards. String heat tape around gutters and the edges of roofs in order to keep ice from forming on ledges. You will need access to an outdoor electrical outlet if you plan on using heat tape. However, the investment alone could save you or a guest from an injury down the road. And, don't forget to follow these additional Steps to Winter-Proof Your Home. After even a light coating of ice, outdoor ramps can morph into hazardous ice luges and stairways can be tough to climb. Use rock salt or an alternative de-icing method on any stairways or ramps on your property. Having proper outdoor lighting (porch lights, floodlights, and walkway lights) can go a long way to keep your incoming and outgoing guests safe. Even though record snowfalls and frenzied flurries typically receive the lion's share of attention during the colder months, when it comes to treacherous conditions this time of year, they are just the tip of the iceberg. Never underestimate the potential hazard that ice can pose. By taking a few extra precautions, you can help protect against many frozen hazards, however accidents can still happen—even with the best snow tires and tread on your boots. If you are ever injured in a winter car accident or slip and fall accident, we're available 24/7 to help. It's free to speak with our legal professionals, and you're never required to hire our law firm after calling us.